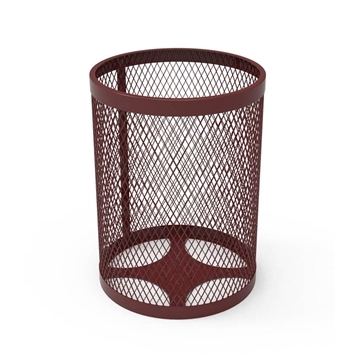 Heavy-duty plastic coated steel trash cans from Picnic Furniture provides durability and a sleek style to both indoor and outdoor locations. Coated with durable thermoplastic materials which cover the expanded steel, adding a protective layer resistant to rust and corrosion. 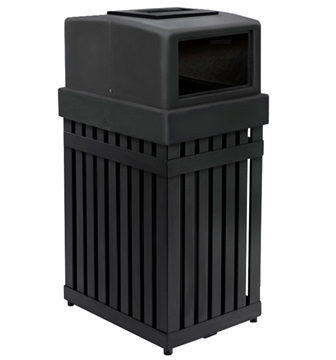 We offer commercial grade plastic coated trash cans that are available in 15 vibrant colors and 4 different frame tops so you can find the perfect trash receptacle for your venue. Our plastic coated trash cans are a favorite at parks, streetscapes, shopping centers, stadiums, resorts, and restaurants nationwide. Picnic Furniture's plastic coated steel trash cans are proudly constructed in the USA with a 5-year commercial warranty provided. We specialize in custom logo trash receptacles as well as benches. We can customize your outdoor furniture to brand your company's design. Call and ask our knowledgeable staff for professional assistance to send you a proof. The durable plastic coating of our steel trash cans is available in many vibrant colors to match public and private decors.